The Kellams line of handcrafted jewelry boxes and accessories were available exclusively in fine craft galleries from Paris to Honolulu since 1980, and are still collected and used by people around the world. We have retired from making the boxes to pursue other interests. Every box received the full personal attention of Thom and Sue Kellam at every step from the original design to the final polish of the hand rubbed natural oil finish. The Kellams started with premium wood from locally harvested American Black Cherry and other hardwood trees. After individually carving the unique form of each container from the rough lumber it took 15 or more sanding steps to bring the wood to the satin smooth surface that invites your caress. 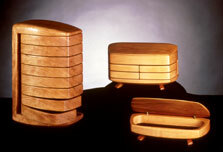 View the full line of Kellams jewelry boxes. We enjoyed having the opportunity to share our creative vision with everyone and have been very grateful to all of the gallerys that have represented our creations to people around the world over the past 38 years. Please contact the gallery of your choice to discover if they still have any Kellam creations.